Take teamwork to the next level with Microsoft’s intelligent hub for integrated group communication and collaboration. Teams is Microsoft’s latest teamworking solution built for today’s workforce. It provides chat and online meeting services integrated with Office 365 business applications and advanced AI capabilities, giving global, remote and dispersed teams the ability to collaborate and share information in a secure central hub. BroadConnect takes Teams further with access to high-quality, feature-rich enterprise voice services on a single, unified Office 365 platform. Users can collaborate and handle calls on any device, improving productivity and flexibility, while reducing overall costs. All up-to-date versions of documents, presentations, spreadsheets and messages are synced and stored in a central hub, with apps and services accessible to every team member. Automated tasks using AI tools, Cortana voice interactions, collaboration and communication from within Office 365 apps, and seamless switching between communication tools enhances productivity. Integration with Office 365, BroadConnect enterprise voice, popular business applications and the Microsoft Graph developer platform offers users a breadth of exciting new features. Virtual assistants, bots, sophisticated AI capabilities, voice commands, inline translation and other advanced communication facilities make Microsoft Teams the intelligent platform for collaboration. Project teams can set up multiple chat rooms, known as Channels, using a separate Channel for each project, department or topic for example. Team members have access to the same apps and services within a Channel and can view complete records of any ‘public’ conversations, chats and other messages. The chats are threaded so they are easy to follow. Team access through this central hub eliminates silos and improves visibility and transparency. However, team members can hold private one-to-one or group chats so that only participants can see the threads. Microsoft Connectors keep your team current by delivering content and updates from external services you frequently use directly into a Channel. Users can receive updates from popular services such as Twitter, Trello and GitHub, for example. All team members are notified of activities from that service, making it easier for all members stay in sync and receive relevant information quickly. Teams provides (70) standard Connectors and you can customize the solution or link to other internal apps using open APIs. T-Bot – users can interact with the bot to ask questions about using Teams and get answers to a wide range of questions. Polly – users can easily conduct and analyse surveys and polls with team members. Growbot – users and leaders can give kudos to team members who deserve recognition for their efforts. Statsbot – users can ask Statsbot questions about metrics or receive scheduled reports automatically from a variety of data sources, including SQL, Google Analytics and Salesforce. Teams can make group meetings easier to set up and more productive. Voice interaction facilities, for example, enable users to set up, join or add participants to a meeting using Cortana. Users can also join meetings from Office 365 applications without leaving their work. Teams features extensive collaborative editing facilities, together with one-click recording and automatic searchable transcription for greater efficiency. And, an inline message translator enables team members speaking different languages to communicate effectively. Users can access high-quality, feature-rich enterprise voice services and unified communications through integration with Skype for Business Online. Users can collaborate and handle inbound and outbound PSTN calls on any device or within Office 365 applications with no need for separate telephone infrastructure. The system provides enterprise-quality HD voice with advanced call handling features, including Presence, call forwarding, simultaneous ringing on all devices and automatic call recording. Microsoft Teams provides the same advanced security and data protection standards as other Office 365 services. Single sign-on through Active Directory with two-factor authentication and data encryption while in transit and at rest ensure the highest levels of security and compliance. 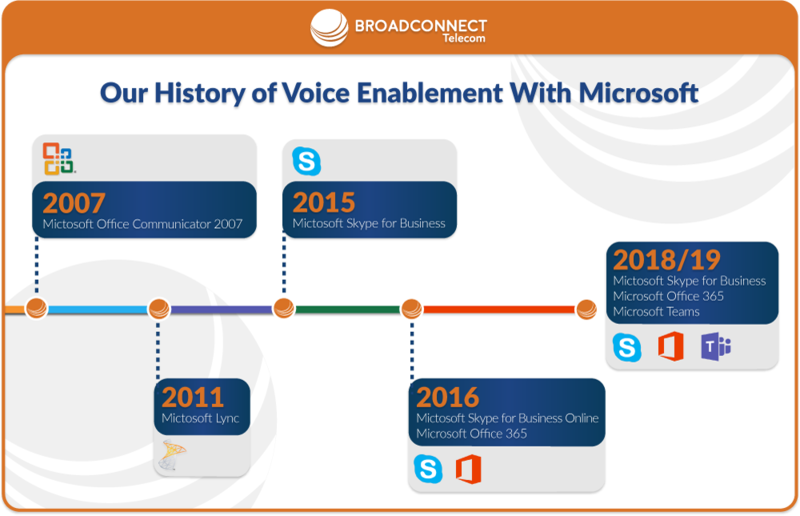 BroadConnect has been a Microsoft partner for more than 10 years and has a wealth of experience in delivering professional services and support for Office 365, Skype for Business and Teams. Our Teams services include consulting, training, integration and support services for strategy and roadmap development, implementation, customization, migration, user adoption and training, backup and recovery options, governance, security, and end-user support. We work in partnership with your team, helping you to reduce costs, improve collaboration and increase efficiency by understanding your requirements, sharing knowledge and best practice, and overcoming challenges. Our business specialists work with you to understand your organization and your teamworking structures, requirements and goals. We provide expert advice on the way Teams can help you achieve those goals and improve collaboration productivity and efficiency. We help you customize Teams to align it with the way your teams want to work. We have the experience and expertise to develop custom extensions and applications and integrate external systems to optimize the collaboration experience. Microsoft Teams is designed as a single, centralized hub for collaboration. Our integration specialists bring together internal and external applications, services and data, and integrate them with the Teams platform to create a customized workspace and eliminate silos. Our specialists can help implement Teams with expert deployment and migration services. They can ensure rapid adoption by providing workshops for users and administrators to enable them to make the most effective use of their solution. Experienced project managers and installation specialists deploy your solution quickly and efficiently to minimize delay and disruption and deliver on time and on budget. Our deployment service covers all aspects of the solution and supports all technologies, capabilities and features currently available for Teams. End-to-end deployment and migration services, including implementation requirements, planning considerations, permissions, provisioning, testing, installation, setup and administration. Integration with SharePoint Online, Exchange Online, One Drive for Business, OneNote and Skype for Business Online. Configuration, customization and extensibility of Teams and Channels aligned to the needs of your business. Configuration and control of third-party external apps. Solutions for document synchronization, backup and restore procedures. Training, documentation and knowledge transfer for stakeholders and users. Why BroadConnect for Microsoft Teams? 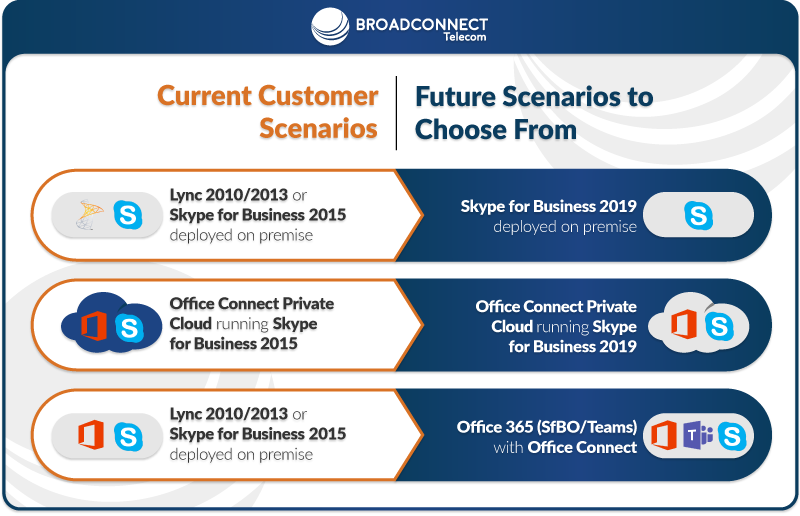 With BroadConnect, you can give users access to the HD voice and unified communications features integrated with Skype for Business Online in Office 365, which works seamlessly with Teams. This cloud-based enterprise-grade system lets your users make and receive inbound and outbound PSTN calls in the office, at home, or on the road, using any desktop or mobile device with Internet access. As well as offering comprehensive calling features, this service works seamlessly with Office 365 applications to improve productivity. The service runs on BroadConnect’s private national T1 fiber-optic network to ensure the highest levels of call clarity, reliability and security. BroadConnect is a long-term partner of Microsoft and understands the technology and potential of Teams. Our team has access to the latest features and services, as well as an understanding of the future development and evolution of this powerful collaboration solution. Our expertise in related Microsoft solutions such as Office 365 and Skype for Business means that we can help you exploit the full potential of Teams. BroadConnect’s comprehensive range of Microsoft-certified professional services means that we can provide expert support at every stage of your Teams lifecycle. As well as initial consultation and solution design, we can implement, integrate and customize your service. And, we can take responsibility for upgrading and maintaining Teams so that you continue to get optimum performance from the latest version available. Your data is protected and stays in Canada in our multiple redundant data centers. Quality is assured because BroadConnect is Canada’s first telecom company to be TL9000 compliant. You also get the benefit of plug-and-play disaster recovery and 24/7 technical support across Canada. With offices in Edmonton, Toronto, Edmonton, Montreal, Calgary, and Vancouver, we have the resources to provide local service and support across the country. We will work with you to develop and deploy the optimum Teams solution for your business and operational needs. Ask a BroadConnect Canada’s Microsoft Teams specialist to contact you and assess your unique needs and challenges.